If you have missed the current round of comics being censored because it may have caused offense to a minority of viewers, then here's what happened. 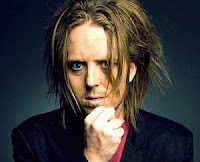 Tim Minchin wrote, and sang, a song that should have been on tonight's The Jonathan Ross Show. however, after performing the item, the song was pulled for "editorial reasons" by ITV’s Director of Television, Peter Fincham in fear of the moral minority may have something to say. He also wrote a whiney blog post about the whole affair. When the story broke, it got me thinking about this performance that was pulled from Late Night with David Letterman. It was from the late, great, comedian Bill Hicks. This was pulled under similar circumstances but, it seems, that it wasn't for "editorial reasons" but to keep advertisers happy. To end, like Tim did on the recording of the show, the plug. Tim Minchen has a new DVD out called Tim Minchin and The Heritage Orchestra - Live at The Royal Albert Hall and is available to buy now.